Connected Cars are the future of driving. For many, they are already here and developing new features very quickly. In this blog we will focus on work we are involved in to provide connectivity to and from vehicles for gathering data and controlling aspects of the car. We have some thoughts on automated cars and more. In a second blog we will provide more information on the technical aspects of using Internet of Things (IoT), Big Data, Web services, Artificial Intelligence and Machine Learning on AWS. As summer comes and the sun shines we give thanks for Air Conditioning in our cars. On a really hot day, however, you can still need a few minutes with the windows down to cool the car. Imagine if you could send a message from your phone to your car a couple of minutes before you reached it to start the cooling process so that you were comfortable immediately to sit in it? Imagine also that you can automatically send the addresses of your sales meetings to your sat nav in the morning. The AI can even work out in advance the optimal scheduling and planning of the meetings. These are small but practical benefits of having routine connectivity to your car and linking it with the endless possibilities of computers. The modern connected car has many sensors collecting diagnostic information on fuel consumption, braking performance, tyre pressures, oil levels, light bulbs, emissions and more. 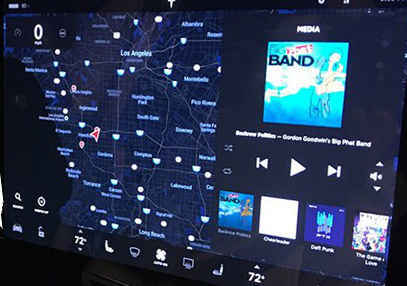 Where we used to have a car radio we can now have multi-functional “infotainment units” that also provide maps and climate controls as well as music. Increasingly, these units are integrated with the core sensors to gather engine performance, advise on driving economically and warn of pending problems. Put very simply, “connected cars” have the ability to transmit data, in batches or in real time, to a central collector. The collector is often a service running in “The Cloud”. The data is analysed and can be used to advise car owners, for example when they should get work done on their cars. The connectivity can be used to download updates, such as updated maps, automatically. Car owners can register for different levels of service to get annual updates or monthly updates for example. With drivers’ permission the manufacturer could carry out further analytics on aggregated data to uncover trends and patterns in failure rates so that maintenance can be planned optimally. Instead of pre-determined replacement of a part at 20,000 miles as per a generic service schedule your careful driving could lead to the part lasting another 10,000 miles. In time, the AI could predict with confidence based on data from thousands of other drivers the impact of different driving styles, trips and other factors on the brakes, tyres and other car parts. Thus, machine learning can revolutionise the way cars are maintained, making even the MOT an automatic test. A simple example could be if the manufacturer notes that headlight bulbs fail after an unexpectedly low amount of night-time driving then they might source a bulb with better longevity and test them out. At the moment, collecting these kinds of statistics is possible, and productionising the capabilities with appropriate data protection and security is the challenge. As well as our core interest in the Machine Learning and Analytics aspects of the projects, security and authorisation are critical to these systems so that data is owned and available only where the driver has granted permission. Insurance companies would love to gather the data, as they already can with black boxes to reward careful young drivers. Perhaps there are new business models for monetising such data. Much of the publicity around the future of cars focuses on “autonomous” vehicles, which implies complete independence. In reality, the state of the art is “automated” driving where a person still has ultimate responsibility and control but can switch to auto-pilot. The concept is familiar to anyone who has ever driven a car with “cruise control”; on a quiet motorway setting cruise control at the national speed limit lets you take your foot off the accelerator and not worry about accidentally exceeding 70mph and catching a speeding fine! In automated cars the sensors react quickly to their environment and apply steering or braking to navigate safely. Built-in cameras detect and interpret road signs and traffic controls. Experiments with automatic cars have been going on for 100 years according to Wikipedia. The Google Self-driving car program (through their subsidiary Waymo) is probably the most advanced. Waymo says they now have over 5 million miles of testing. Waymo also report very high safety levels. The freely downloadable PDF from the link is a fascinating study of “Safety by Design”, that includes a lot of attention to cyber-security. The Society of Automotive Engineers (SAE) has defined six levels of automation ranging from zero (no automation) up to five (complete control with the system and no human intervention). Tesla’s Auto-pilot mode is considered level 2 where the system takes control of steering and speed and humans take control of other aspects. The current legal debates centre around level three where the car system can control but alerts the human driver expecting an action to be taken. Although a Sci-Fi favourite, individual vehicles flying about in mass numbers is impractical due to the cost and risks. “Roads? In the future we don’t need roads” paraphrasing “The Doc” in Back to the Future. Unlike Biff becoming POTUS and hoverboards they got that prediction wrong. We are still building roads, and they are still filling up. The reasons are similar to why we aren’t all flying jetpacks to work “…quarter-mile a gallon and with a motor as loud as a Harley Davidson”. The same sensors and AI technologies used in cars today could surely be adapted to overcome the navigational risks and issues. Look at how birds and insects fly around in huge groups, coordinating their movements and not constantly bumping into each other in a murmuration. No, the main reasons we’re not all flying around in DeLoreans are the cost and environmental impacts, which are being addressed through R&D in electric cars today and by military technologies like drone warfare. So I’m going to make a brave prediction and say that by 2084 (100 years after Back To The Future was made) flying vehicles will be real, I just hope we’re still around to see them. Middle-aged Geek. Arsenal fan. Guitar-playing marathon runner. PhD in AI from Oxford in 1991.